Bond Bryan have designed a collaborative environment wrapped up within a cost-effective solution and a fast-paced programme. 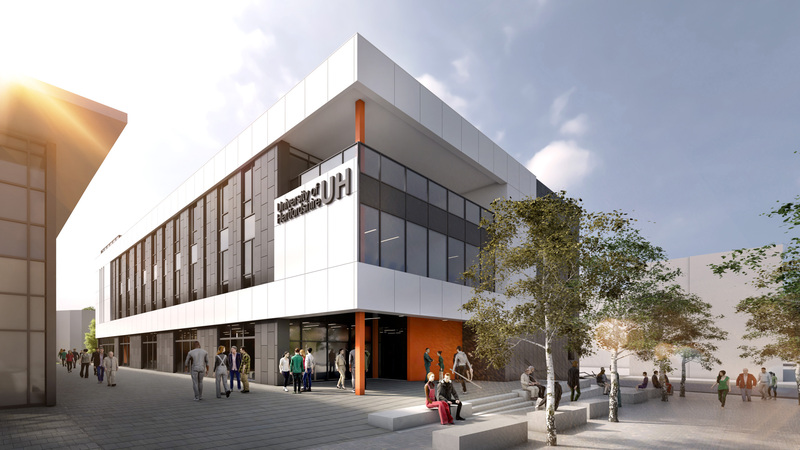 Nestled in the heart of the De Haviland Campus, this bespoke ‘Three in One’ design combines Business Incubator, Social, and Teaching facilities all under one roof for the University of Hertfordshire. Responding to the complex requirements of a brief that calls for a dynamic educational building, Bond Bryan have designed a collaborative environment wrapped up within a cost-effective solution and a fast-paced programme. The new Business and Social Hub’s rectangular design maximises the space provided by the site, whilst the massing of the three-storey building and the internal configuration creates a set of flexible and interlinked, yet also independent, internal functions all connected by the two central atria. At ground floor, the building’s open-plan layout will serve as an informal learning and social space in the daytime, then as a place for social gatherings and events within the evening – utilising furniture to divide the space and create a unique atmosphere that the students can identify with. The Business Incubator space creates an environment for the staff, students, researchers and alumni to assist and accelerate the development and growth of their start-up companies by housing a variety of social networking and creativity areas. This space also utilises a range of fixed and loose furniture to denote different meanings to the open space. This floor’s design and layout create an environment that fosters collaboration, problem-solving and open innovation between the varied creative teams working here, whilst also providing the option of cellular offices and meeting rooms for the more private business development and meeting needs. A dedicated area for MBA students has also been created, allowing them to carry out their studies in a selection of formal and informal areas. Similarly, as in the Incubation space, this is open with the use of dividing furniture giving it the varying functions which it requires. In this part of the building, flexible teaching rooms can be combined – within one or two large exam halls alongside the main MBA area – with an open plan collaboration and break-out space being provided, together with a terrace. The range of flexible spaces sits across the building’s three storeys, wrapped around the two central atria and is linked together by a feature staircase spanning all three storeys that animates the void and provides a physical and visual link between the assorted spaces. This centralised circulation method encompasses the building’s ethos, enabling people to meet within the building’s circulatory routes whilst also allowing visual permeability for the users of the building into the interconnected areas – creating a visual element of collaboration between the building’s many functions. This vibrancy from the ground floor filters up through the central atria whilst each floor is also able to maintain an element of privacy within each flexible, open-plan space. Externally, the building’s appearance speaks to its diverse, yet harmonious, internal functions through the two contrasting materials used to form the interlocking volumes. This subtly reduces the massing and form of the building whilst also creating a strong 360-degree presence on the site, with each of the four elevations being equally important for the articulation of the building’s external form. Working collaboratively with our client Willmott Dixon Construction, Bond Bryan are set to deliver the Business and Social Hub during 2019 with completion to take place in early 2020.